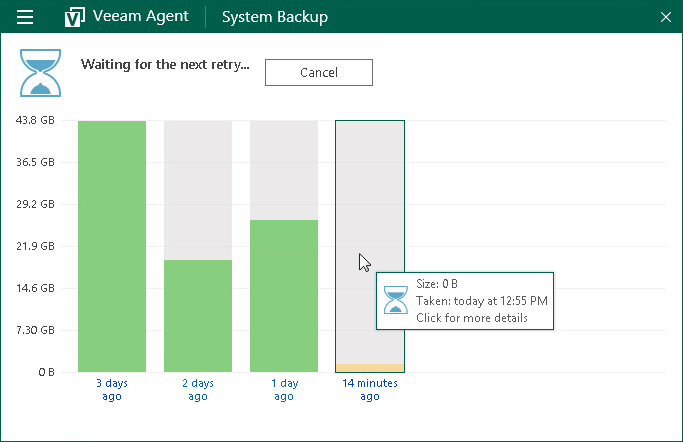 If the backup job started by schedule has failed for some reason, Veeam Agent for Microsoft Windows retries the job. All backup job retries are performed within one backup job session. For this reason, Veeam Agent for Microsoft Windows displays them as one bar in the chart. 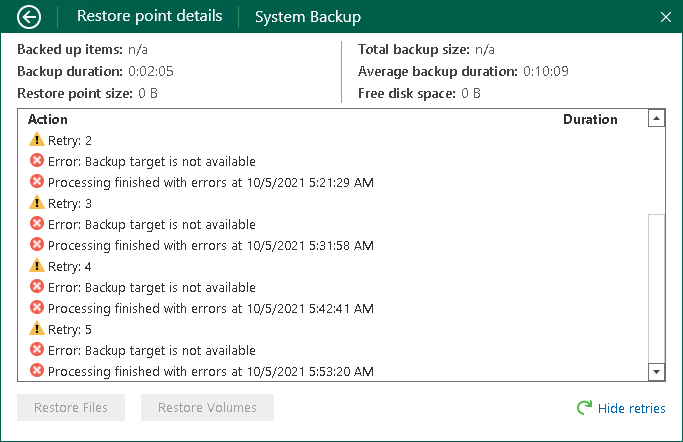 For portable devices, Veeam Agent for Microsoft Windows does not automatically retry the backup job if a device is working on battery. At the top of the Control Panel window, check the name of the backup job. If multiple backup jobs are configured in Veeam Agent for Microsoft Windows, and you want to view statistics of another job, in the main menu, hover over the name of the necessary job and select Open. Click the necessary bar in the chart. At the bottom right corner of the window, click the Show retries link. After you view details, you can hide them. To do this, at the bottom right corner of the window, click the Hide retries link.